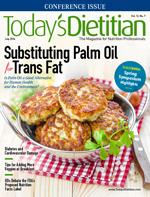 Dietitians play an important role in its treatment and management. Gastroparesis, or delayed gastric emptying, is a condition in which the stomach takes longer than it should to pass its contents to the small intestine. This “stomach paralysis” results in a host of uncomfortable symptoms that can greatly reduce the quality of life for its sufferers. Symptoms of gastroparesis can range from mild to severe, depending on the individual. The most common include nausea, vomiting, and early satiety. Since food doesn’t move through the stomach at a normal pace, many patients report feeling full and bloated after eating. The feeling of fullness can result in inadequate food intake, which can lead to malnutrition and vitamin and mineral deficiencies. “The nausea and vomiting in some patients is so severe that they really have to work hard to get enough nutrition,” says Marcia Nahikian-Nelms, PhD, RDN, LD, CNSC, a clinical professor and the director of the dietetic internship program at Ohio State University. Many conditions can cause gastroparesis, but diabetes is one of the most common etiologies. Neuropathy, which is a diabetes complication, can damage the vagus nerve, one of the primary autonomic controls for gastric emptying, Nahikian-Nelms says. The American Diabetes Association says individuals with diabetes dealing with gastroparesis may need to administer insulin more often, administer insulin after eating instead of before, or frequently check their blood glucose levels and administer insulin when needed. Physicians can diagnose gastroparesis in several ways. If patients present with symptoms consistent with the disease, they’re likely to first undergo an upper endoscopy to rule out any mechanical obstruction or ulcer. If no obstruction is present, the next step usually is scintigraphy, a diagnostic test considered the gold standard for measuring the rate at which solids and liquids empty from the stomach in a four-hour period. During the test, patients consume solid foods and liquids with a small amount radioactive material, and examiners identify the rate of gastric emptying at one-hour intervals. “If the study is positive, which is usually defined by gastric retention of more than 10% in four hours, then that would help to confirm our diagnosis,” says Shawn Khodadadian, MD, a gastroenterologist and the director of clinical nutrition in the gastroenterology division at Lenox Hill Hospital in New York City. RDs who administer MNT to patients should encourage them to eat small but frequent meals (six to 10) per day to decrease bloating, early satiety, and other symptoms. Food choices are just as important as reducing the amount of food eaten at each meal. “As far as the choice of foods, we emphasize low-fat foods because high-fat foods have a longer gastric emptying time,” Nahikian-Nelms says. The Academy of Nutrition and Dietetics agrees but states that liquids that contain fat, such as milkshakes, can be tolerated and provide extra calories. In addition, low-fiber foods are recommended because fiber is known to slow gastric emptying, Nahikian-Nelms says. Dietitians also should suggest patients eat low-residue foods such as refined breads, white rice, and white pasta, plus cooked vegetables and canned fruit because they’re better tolerated than fresh fruits and vegetables. The Nutrition Care Manual recommends patients consume skim milk, instant breakfast beverages, yogurt, pudding, custard, smoothies, puréed foods, and soup. “There’s a subgroup of patients who have more difficulty with solid foods. They tend to do better with puréed or liquid foods,” Khodadadian says. He also recommends patients avoid carbonated beverages, alcohol, and smoking, which can slow down gastric emptying. Light physical activity after meals can help speed up gastric emptying rates, so RDs should suggest patients take a walk after eating to improve digestion instead of lying down after meals. If MNT doesn’t completely alleviate symptoms, medications also can be used to treat gastroparesis. “We have prokinetic agents that help speed up stomach emptying, such as metoclopramide [Reglan], domperidone [Motilium), and erythromycin,” Parkman says. Metoclopramide is the only FDA-approved drug for gastroparesis; the other two are used off label. “We [also] have antiemetic agents that are good for reducing nausea and vomiting.” Common antiemetic medications include diphenhydramine (Benadryl) and ondansetron (Zofran). While medications can help reduce symptoms, they aren’t a panacea. For example, metoclopramide must empty through the stomach, so this can be an issue in patients with delayed gastric emptying, Parkman says. The National Institutes of Health and the FDA know that more medications are needed to treat this disease. “Pharmaceutical companies are looking at novel ways to treat gastroparesis,” he says. Instead of administering metoclopramide orally in tablet form, companies are researching ways to give it to patients in a nasal spray so it bypasses the stomach and gets absorbed through the nasal mucosa to speed up gastric emptying, Parkman adds. When medications and dietary changes aren’t enough to treat gastroparesis, enteral nutrition is an option. “There’s a subgroup of patients who ultimately need enteral nutrition. [They] have persistent weight loss and are unable to control their symptoms,” Khodadadian says. In these cases, a jejunostomy is inserted into the small intestine to provide the proper nutrition to patients. This is preferred because it bypasses the stomach, he says. Regardless of the interventions prescribed, dietitians must remember how imperative their role is in gastroparesis treatment. 1. Gastroparesis. American College of Gastroenterology website. http://patients.gi.org/topics/gastroparesis. Updated December 2012. Accessed April 23, 2014. 2. Camilleri M, Parkman HP, Shafi MA, Abell TL, Gerson; American College of Gastroenterology. Clinical guideline: management of gastroparesis. Am J Gastroenterol. 2013;108(1):18-37. 3. Hasler WL. Gastroparesis: current concepts and considerations. Medscape J Med. 2008;10(1):16.